As soon as Oshiomhole said this, shouts of “Ole! Ole! Ole!” (thief, thief, thief) rent the air as the suspected party thugs pelted him with stones. 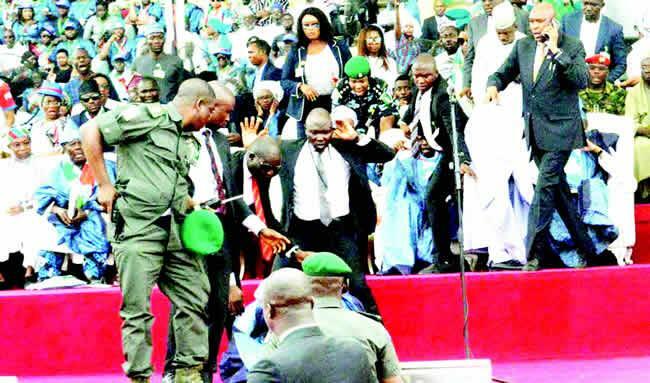 The atmosphere became charged to the extent that Amosun had to mount the podium again to beg the hoodlums to stop the attacks on Oshiomhole and others. Appealing to the angry crowd, he said, “I beg you in the name of God. This is what they want to happen. Please don’t disgrace me here,” he said in Yoruba. Despite the breakdown of law and order at the rally, Oshiomhole hurriedly presented the party flag to Abiodun. He said, “The other one, we will resolve it on March 2nd. We are respecting President Muhammadu Buhari. Don’t transfer your anger to the APC. This, it was observed, provoked the APC leaders at the rally as a former governor of Osun State, Rauf Aregbesola, took the microphone and described Amosun as a hypocrite. While the situation was tense, Osinbajo was called to make his remarks but he initially rejected the offer. He was prevailed upon by Amosun to make his speech. In his speech, Osinbajo said he believed that the current administration deserved a second term. He reiterated the President’s resolve to tackle corruption, affirming that it was possible to build a country free of corruption. “Our country’s major problem is corruption. Our country is not short of money or ideas but it is short of men of character to use the resources judiciously,” he said. The party, in a statement by its spokesman, Tunde Oladunjoye, alleged that Amosun used thugs to cause violence at the APC rally. The party said members of the caretaker committee were stopped from mounting the podium by Amosun’s thugs with obvious compromise of some security agents attached to the governor. It said that act, not only embarrassed the President and his entourage, but had actually embarrassed the whole people of the state. Ogun APC stated, “While tendering this apology, we are happy that the Department of State Services and other agencies have details of the sad events, which we urge them to submit to the Presidency. When contacted, the embattled APC Publicity Secretary, Wole Elegbede, said the protest at the rally was to express the faction’s rejection of Abiodun’s candidacy. Elegbede said the party was not happy over the incident, though he said the national leadership should be blamed for the protests. He said, “The APC, Ogun State chapter, under the leadership of Chief Derin Adebiyi, will not like to reply anyone. What happened was between the APC supporters in the state. Some supporters are aggrieved by Abiodun’s emergence as the governorship candidate, while some like it. “But our supporters are happy with President Muhammadu Buhari and are ready to vote for him in the forthcoming election. However, the violence spread to parts of Abeokuta, including Oke-Ilewo ,Iyana-Mortuary, Oke-Mosan, and Panseke on Monday evening. It was also gathered that in Ijebu-Ode, supporters of the APC and the APM clashed. Earlier at the MKO Abiola Stadium on Monday morning, security agents searched people that came for the rally. They arrested some thugs armed with dangerous weapons and charms. Some people believed to be Akinlade’s supporters were seen chasing away Abiodun’s sympathisers from the stadium. The victims jumped the fence to avoid being harmed by the attackers who threw some dangerous objects including stones and sticks at them. Many of the victim’s sustained injuries while running away from the attackers. After the programme, Abiodun’s supporters laid an ambush for members of Amosun’s faction of the APC and attacked them. The former Commissioner for Forestry in the state, who is the APM candidate for the House of Representatives, Kola Lawal, from Yewa South / Ipokia federal constituency, was reportedly attacked by Abiodun’s supporters. However, the PDP on Monday said the assault on President Buhari, the Vice-President and the party chieftains was a direct message by Nigerians that they had rejected the party.